The Green Seattle Partnership uses a four-phase approach to restoration. This means that at any given time a restoration project site within a Seattle park is considered to be in one of four possible restoration phases – from “covered in weeds” all the way to happy, healthy forest. Each park’s phase determines the restoration work that gets done, until it is ready to graduate to the next phase. Within each park there are many different management units that help us organize our restoration activities. We refer to these as “zones.” Even within each zone there can be restoration sites in various phases of restoration differentiated by their own ecological characteristics. Different plant associations and forest health issues reveal themselves throughout our different forests. 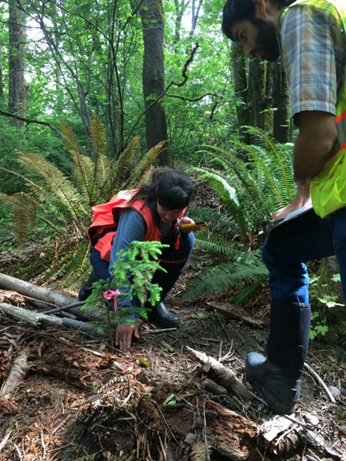 In 2015, Seattle Parks and Recreation initiated a project to determine which restoration zones were ready for the final phase of long-term stewardship and maintenance. 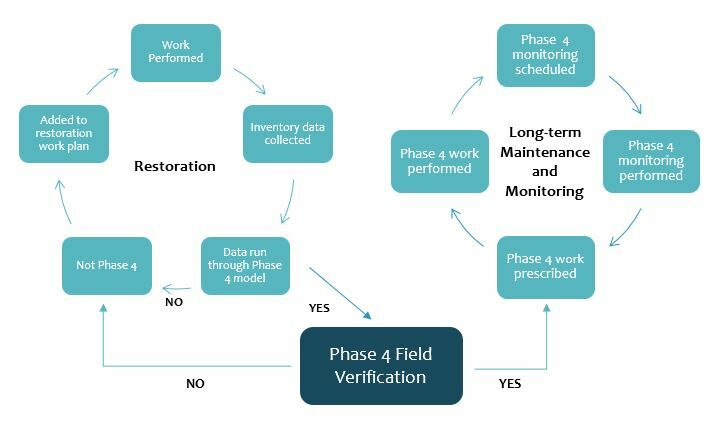 The Phase 4 Verification Project is helping us do two important things: measure restoration success and budget for future efforts. To determine which zones will be considered for Phase 4, we use data collected during our Inventory of active restoration sites. The Inventory covers about 350 acres annually and helps us capture data on things like tree canopy and species diversity. Then, back in the office, data for each zone is compared to specific characteristics of healthy forests that we use as references. These healthy examples we call “Target Ecosystems”. The table below shows the Target Ecosystems and their associated metrics. If a Green Seattle Partnership restoration zone matches enough desired attributes, it gets on the short list to be considered for the distinguished Phase 4 status. Not to oversimplify things, but the following attributes are some of the best expressions of a healthy Seattle forest: a nice canopy of conifers, madrones or oaks + a diversity of new native trees and understory plants + almost zero weed coverage + low numbers of invasive trees growing. We do everything we can – within reason – to cultivate the environment for healthy natural areas in Seattle’s forested parkland. The Target Ecosystem in a park or zone describes the reference habitat that we intend to replicate, corresponding to an ecosystem identified by the Washington State Department of Natural Resources Natural Heritage Program. 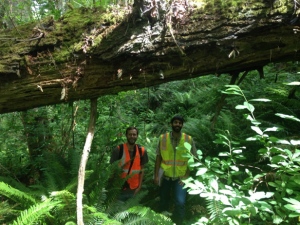 Nested deeper within that classification are Target Forest Types, which are native plant associations (collections of plant species often found together in similar habitats) historically found in the Puget Trough that provide more specific planting palettes to guide restoration. Comparing the target ecosystem metrics against our own inventory data, 2015 through year-to-date, there has been 170 candidate zones, representing 461 acres in 47 different parks. But the process isn’t over at this point. There is one more step to determine which candidate zones are actually good enough to be called Phase 4. Seattle Parks Plant Ecologists conduct field verification, visits outside to the parks, which offer an important opportunity to visit each zone with a critical eye for long-term stewardship and maintenance. 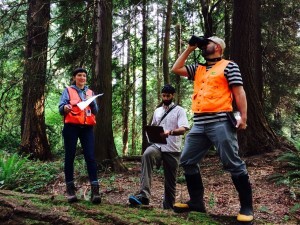 In addition to verifying that the inventory data accurately represented the site conditions (tree regeneration, species diversity, canopy cover, invasive weed presence), the team also reviews how much work (volunteer + professional crews) has been invested into each zone while also collecting information to support workplanning. Observations on potential ecological threats and weaknesses inform any near and long-term work needs. UW Graduate Student Derek Buchner performed additional analysis of the data we collected in 2015. Derek completed his thesis from the University of Washington Master of Environmental Horticulture program, named “Examining Restoration Success after Ten-years of the Green Seattle Partnership: Implementation and Results of the First Phase 4 Verifications.” The following table captures some of his analysis on 79 zones (limited analysis due to data availability at the time of his project). The weakest and 2nd weakest ecological characteristics are the issues the team felt were the greatest threats to the success of the restoration and overall health of the forest. The great news is that so far 77 zones (encompassing 191 acres of Seattle’s park system) did pass the test in the last two years of the project! Now that GSP is in year 12 of an originally-conceptualized 20-year restoration program, many of these forests represent the fruits of our earliest efforts at restoration. It doesn’t mean now we can just walk away. Remember, we have transitioned these healthy forests into a category of long-term stewardship and maintenance. However, many zones did not qualify because they fell short on the target metrics. We found a few shortcomings, for example, low tree regeneration, low species diversity, lack of canopy cover or persistent invasive weeds. Although some zones don’t move into Phase 4, the process allows the team to develop a list of work to be accomplished before we consider the zone again. In some instances, the team observed simple things that could be easily addressed like planting more plants or more focused weeding. In other cases, even if most of the zone looked awesome, we found nasty Class A noxious weeds, need for erosion control, “party spots” with a lot of garbage and trampled plants, damage from off-leash dogs, or root rot in mature trees. These issues call for more targeted, and perhaps long-term, strategies to address the health of the forest. 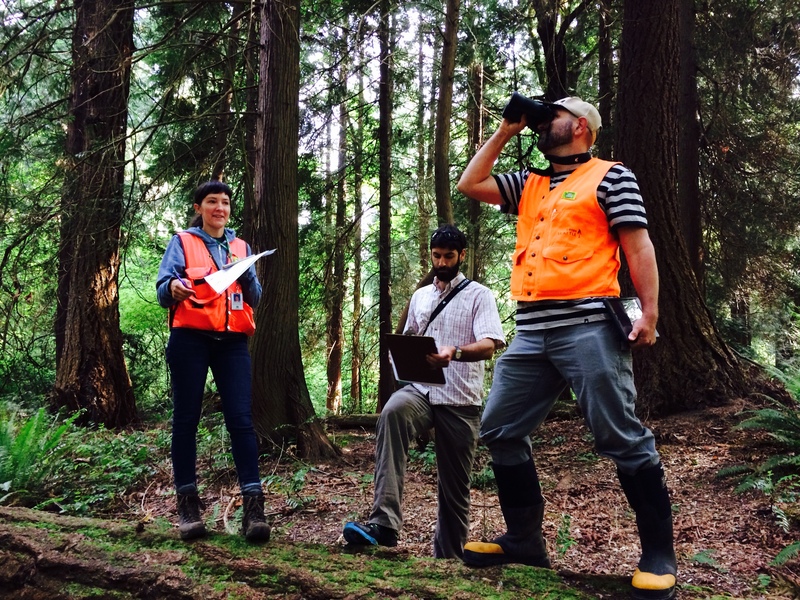 In June, the team is about to head out again to see Seattle’s healthiest forests. We will be roaming through the short list of Phase 4 candidates, approximately 36 parks encompassing 300 acres of forested parkland!